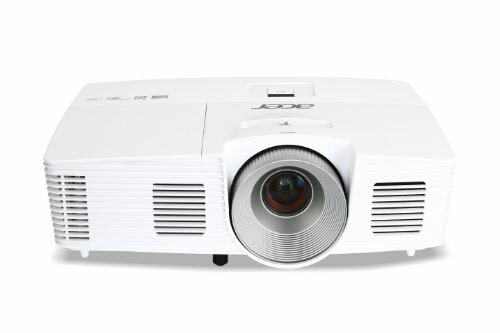 When it comes to inexpensive but high-quality projectors, few manufacturers can touch Acer, since it has been releasing home entertainment and home theater projectors that are affordable but great-quality, and their projectors have received great attention from consumers who are budget-conscious. Acer’s H5380BD is great for home entertainment, and its 720p native resolution makes it an inexpensive and great way to bring 3D into your home. With an average 5000 hour lamp life, 3000 lumens of brightness, built-in 2W speaker, and light weight as well as small form factor, this is a powerful and portable projector for video, gaming, film, and more. The Acer H5380BD is for people who consider “regular” television too small, yet don’t want to spend huge amount of money to get a massive image. Also, it will work great for those who just wish to project occasional TV shows, games, and movies, perhaps on a wall. The performance of this projector is such that is works perfectly as an inexpensive home theater as long as you are willing to settle for its 720p resolution. If you already have a projector that is more than a couple of years old or is not HD, this would probably be an improvement. Also, if your projector isn’t that bad, but is not very bright, then this is definitely great improvement. DLP Link is an inexpensive and solid implementation of a technology which has a reputation for being pricy and finicky. Its advantages are that it doesn’t require an emitter, is not very susceptible to ghosting artifacts or crosstalk, and has affordable brand-agnostic glasses. Furthermore, this projector has a sharp, bright image with solid black level and loads of shadow detail. Even though this projector features a native 720p resolution, it truly looks amazing when fed native Full HD content from a console or a Blu-ray player. The projector’s 2W mono speaker is not much, but it is more than enough when you are on the road. For the occasions when you need to bring this projector over to your friend’s house, an onboard speaker ensures the use of the projector without having to connect an external audio system. At full power, this model features an expected lamp life of 5,000 hours. This goes up to 6,000 hours in Eco mode, as well as up to 10,000 hours when in Extreme Eco mode. This isn’t a user-selectable mode, but a special power-saving mode that this projector switches into if no input signal is selected. It is really useful if you often forget to turn off the projector. However, this model also boasts an automatic shut-off feature.